If you’ve grown tired of seeking out stock photos that no one else already used a million times for your digital content and social media posts, you may consider drawing your own cartoons. You’ll end up with an original image and maybe even a recurring character for future posts! Wait. What’s that you say? You don’t know how to draw? Anyone can learn how to draw. Really! When I was in computer animation school way back when dial up Internet was all the rage, the big lesson that was drilled into us was that the computer is only a tool. You still need to know how to draw if you’re planning on making art with it. So I thought I was headed for a really bad grade in art school when one of the compulsory courses was figure drawing. We’d be learning how to draw actual people. With models. I’ve never been able to draw realistic renderings of people. Animals, objects, and aliens, yes. But people, no. So it was to my surprise when on the very first day of class, the professor told us the unexpected – “anyone can learn how to draw”. The first is a general rule in everything is life: keep practicing. Or in this case, keep drawing. It’s like taking up a sport. The more you play, the better you will be at it. The less you draw, the more rusty and rigid your figures will become. So keep drawing. Secondly, I owe my gratitude to the second thing my professor told us on the first day of class. She advised us to get the book “Drawing on the Right Side of the Brain” by Betty Edwards (full disclosure, I am not affiliated with the book or its author). This book can teach anyone to draw. It covers all the basics with drawing exercises to do from the basics to the advanced and before long, you’re able to draw fantastic portrait of your cat! Or family member. Or whatever you fancy. You’ll realize just like I did that gaining drawing skills really only requires time and practice. Sharpening my figure drawing skills has helped me draw better comics even though I’m drawing cartoony figures. My characters appear less rigid and more polished the more I keep in practice with drawing people in different poses and using different gestures. It’s like staying physically fit. You have to keep at it. 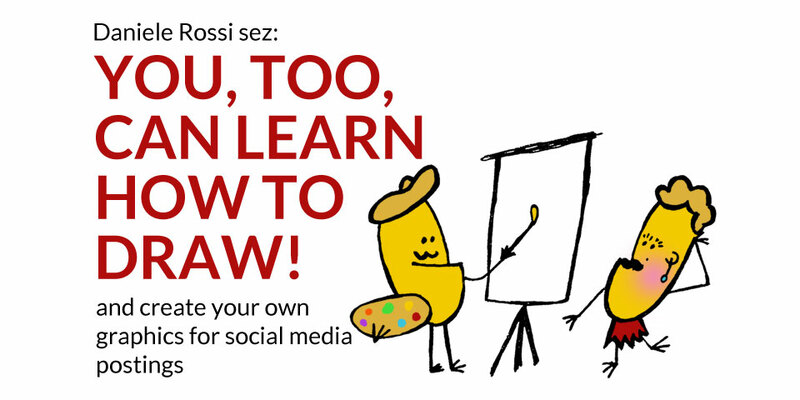 Are you going to give drawing your own cartoons a try for your content marketing or social media postings?